This is a fun Wagashi (Japanese confectionery) idea for halloween!!! It tastes just like Dango (Japanese sweet dumplings). 1. Put Shiratamako, Matcha and water in a bowl and knead the dough with your hand until smooth. Adjust the texture by adding more Shiratamako or water until the dough turns as soft as your earlobe. 2. Form the dough into worm-like small strips. 3. Bring a large pot of water to a boil. Gently drop Shiratama worms in the boiling water. After a few minutes, Shiratama worms will float to the surface. Boil for another 1-2 minutes. Then remove from the boiling water and transfer into cold water (to cool and remove the slimy texture). After a minute, drain well. 4. 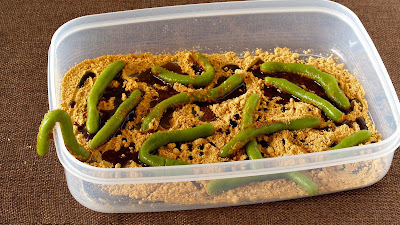 Place Kinako and Kuromitsu on a plate or in a flat container, then place the worms on top. *You can store the Dumplings in the freezer. When you eat, defrost at room temperature OR microwave OR cook in boiling water. *You can store the Dumplings in the fridge for 3 hours but they can easily get hard, so I don't recommend it.